Don’t proceed with elective surgery in patients with properly diagnosed and correctable anemia until the anemia has been appropriately treated. Anemia is common, presenting in approximately one-third of patients undergoing elective surgery. There is often the misconception that anemia is harmless, when, in fact, it is independently associated with significant morbidity and mortality that can be as high as 30-40% in certain patient populations. Treatment of anemia improves patient readiness for surgery, aids in management of comorbid conditions, decreases length of stay and readmission rates, and reduces transfusion risks. Treatment modalities may include nutritional supplementations, such as iron, B12 and folate, changes in medication, management of chronic inflammatory conditions or previously undiagnosed malignancy, or other interventions based on the etiology. Don’t perform laboratory blood testing unless clinically indicated or necessary for diagnosis or management in order to avoid iatrogenic anemia. Up to 90% of patients become anemic by day 3 in the intensive care unit. Although laboratory testing can aid in diagnosis, prognosis and treatment of disease, a significant number of tests are inappropriate or unnecessary. Anemia secondary to iatrogenic blood loss causes an increased length of stay and mortality. Increased phlebotomy for laboratory testing also increases the odds for transfusion and its associated risks. Unnecessary laboratory testing adds to the cost of care through laboratory test charges and also by increasing downstream costs due to unnecessary interventions, prescriptions, etc. Thus judicious use of laboratory testing is recommended, and testing should not be performed in the absence of clinical indications. Don’t transfuse plasma in the absence of active bleeding or significant laboratory evidence of coagulopathy. Recent studies demonstrate that plasma is often transfused inappropriately. In the absence of active bleeding or clear evidence of coagulopathy, current literature shows no reduction in blood loss or transfusion requirements with the use of plasma, but shows increased risk of transfusion-associated adverse events such as transfusion-related acute lung injury, transfusion-associated circulatory overload and allergic reactions. These transfusion-associated adverse events lead to poorer outcomes and increased cost of care. Avoid transfusion when antifibrinolytic drugs are available to minimize surgical bleeding. Antifibrinolytic pharmacologic therapy has been shown to reduce blood loss and transfusion requirements in orthopedic and cardiovascular surgeries. Early administration of tranexamic acid, specifically within three hours, in trauma and obstetric hemorrhage significantly reduces mortality and bleeding. Avoid transfusion, outside of emergencies, when alternative strategies are available as part of informed consent; make discussion of alternatives part of the informed consent process. Informed choice/consent regarding transfusion and other effective methods should be standardized and consistently delivered. Throughout the world, there is wide variation among medical practitioners and hospitals with regard to medical knowledge about the true risks of transfusion, alternatives to transfusion, and the delivery of this information to patients. Outside of the truly emergent clinical situation, transfusion should be avoided or limited when other interventions are available. Alternative strategies include, but are not limited to pharmacologic agents, cell salvage, normovolemic hemodilution and minimally-invasive surgical techniques. The Society for the Advancement of Blood Management (SABM) was founded in 2001 by health care providers, nurses and physicians who saw the need for a new way of thinking about transfusion as a therapy. SABM included thought leaders who promulgated the concept of patient blood management as the new standard of care. The SABM mission is broad, its foundation based on appropriate evidence-based transfusion guidelines, the management of anemia, optimization of coagulation and minimization of bleeding, and utilization of interdisciplinary blood conservation strategies. The goal is improved patient outcomes. Today, SABM is recognized as a key educational resource for patient blood management. SABM is grounded in scientific validation and evidence-based practices, and focused on promoting the patients’ best interest through effective and optimal patient blood management. Given our mission and message, SABM is truly honored and proud to partner with the Choosing Wisely campaign. 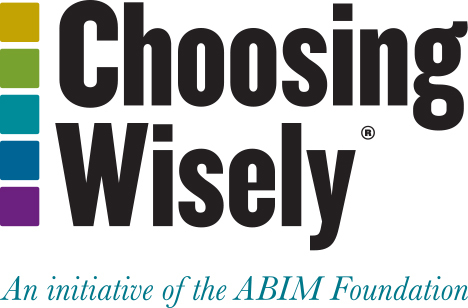 The Executive Committee and Board of Directors (BOD) of the Society for the Advancement of Blood Management (SABM) had a strong desire to participate in the Choosing Wisely campaign. Participation allows SABM to align with the national Choosing Wisely team and other specialty societies to further the mission of collaborative physician-patient health care delivery and responsible use of resources. A Task Force was appointed from within the BOD to draft the initial set of recommendations. Evidence-based recommendations were based on our society’s foundational pillars and structured around published SABM Standards. A critical feature was the review of relevant literature for supporting evidence applicable to each statement. Ultimately, the draft recommendations were submitted to the membership for input via an email survey. This resulted in the final five statements for which evidentiary materials and pertinent references were written. The BOD approved the materials prior to submission. Working with this initiative, our selected recommendations and integrated materials were further honed based on subsequent campaign review. The list and supporting evidence will form the basis of a manuscript for publication in a peer-reviewed journal. SABM will also develop monitors to assess the impact of the initiative for our members and hospital affiliates. We foresee this as a vehicle for outreach to other professional societies, health care providers and patients. Mursallana KM, Tamim HM, Richards T et al. Preoperative anaemia and post operative outcomes in non-cardiac surgery: a retrospective cohort study. Lancet 2011; 378 (9800): 1396-4007. Koch C, Li L, Sun Z et al. Hospital-acquired anemia: prevalence, outcomes, and healthcare implications. J Hosp Med 2013; 8(9): 506-512. Beattie WS, Karkouti K, Wijeysundera DN, Tait G et al. Risk associated with preoperative anemia in non-cardiac surgery; a single-center cohort study. Anesthesiology 2009; 110 (3): 574-581. Munoz M, Acheson AG, Aurbach M et al. International consensus on peri-operative anemia and iron deficiency. Anaesthesia 2017; 72: 233-247. Patient Blood Management Gombotz, Zacharowski & Spahn (eds. ), Thieme Publishers, 2016. Gattinoni L and Chiumello P. Anemia in the intensive care unit: how big is the problem? Transfus Altern Transfus Med 2002; 4 (4): 118-120. Thavendranathan P, Bagai A, Ebidia A et al. Do blood tests cause anemia in hospitalized patients? The effect of diagnostic phlebotomy on hemoglobin and hematocrit levels. J Gen Int Med 2005; 20(6): 520-524. Chant C, Wilson G, Friedrich JO et al. Anemia, transfusion, and phlebotomy practices in critically ill patients with prolonged intensive care unit length of stay: a cohort study. Crit Care 2006; 10 (5): R140. Stanworth SJ, Brunskill SJ, Hyde CJ et al. Is fresh-frozen plasma clinically effective? A systematic review of randomized controlled trials. Brit J Haematol 2004; 126(11): 139-152. Holland LL, Foster TM, Marlar RA, Brooks JP et al. Fresh frozen plasma is ineffective for correcting minimally elevated international normalized ratios. Transfusion 2005; 45(7): 1234-1235. Segal J and Dzik W. Paucity of studies to support that abnormal coagulation test results predict bleeding in the setting of invasive procedures: an evidence-based review. Transfusion 2005; 45(9): 1412-1425. Stanworth S, Grant-Casey J, Lowe D et al. The use of fresh-frozen plasma in England: high levels of inappropriate use in adults and children. Transfusion 2011; 51(1): 62-70. Yang L, Stanworth S, Hopewell S et al. Is fresh-frozen plasma clinically effective: an update of a systematic review of randomized controlled trials. Transfusion 2012; 52(8): 1673-1686. Muller M, Arbous MS, Spoelstra-de Man AM et al. Transfusion of fresh-frozen plasma in critically ill patients with coagulopathy before invasive procedures: a randomized controlled trial. Transfusion 2015; 55(1): 26-35. Green L, Bolton-Maggs P, Beattie C et al. British Society of Haematology guidelines on the spectrum of fresh frozen plasma and cryoprecipitate products: their handling and use in various patient groups in the absence of major bleeding. Brit J Haematol 2018; 181(1): 54-67. Henry DA, Carless PA, Moxey AJ et al. Anti-fibrinolytic drugs for reducing blood loss and the need for red blood cell transfusion during and after surgery. Cochrane Database Syst Rev 2011; (3): CD001886. CRASH-2 Trial Collaborators Effects of tranexamic acid on death, vasoocclusive events, and blood transfusion in trauma patients with significant haemorrhage (CRASH-2): a randomised, placebo-controlled trial. Lancet 2010; 376(9734): 23-32. WOMAN Trial Collaborators Effect of early tranexamic acid administration on mortality, hysterectomy, and other morbidities in women with post-partum haemorrhage (WOMAN): an international, randomized, double-blind, placebo-controlled trial. Lancet 2017; 389(10084): 2105-2116. Friedman M, Arja W, Bata R et al. Informed consent for blood transfusion: What do medical residents tell? What do patients understand? Am J Clin Pathol. 2012 Oct;138(4):559-65. Davis R, Vincent C, and Murphy M Blood transfusion safety: the potential role of the patient. Transfus Med Rev 2011; 25(1) 12-23. Booth C, Grant-Casey J, Court EL et al. National comparative audit of blood transfusion: report on the 2014 audit of patient information and consent. Transfus Med 2017: 21(3): 183-189. Vossoughi S, Macauley R, Sazama K, and Fung M Attitudes, practices, and training on informed consent for transfusions and procedures. Amer J Clin Path 2015; 144: 315-321. Howell CA and Forsythe JLR Patient consent for blood transfusion- recommendations from the SaBTO. Transfus Med 2011. 21: 359-362. Court EL. Robinson JA, and Hocken DB Informed consent and patient understanding of blood transfusion. Transfus Med 2011; 21: 183-189.